Last autumn we took a short family holiday to the Valais. During the trip we visited Distillery Morand in Martigny. Famed for their Williamine (a strong, pear spirit) and Abricotine (Valais’ protected apricot schnapps), they have been in business since 1889. Four generations back, Morand the elder was making not only schnapps, but spirits, including his Grand St Bernard, flavoured with alpine herbs and honey. They still make their “pear in a bottle” Williamine by attaching bottles to pear blossoms in the spring and letting the pears grow within. Their shop in Martigny is a delight, with wall to wall bottles and other local specialities. A friendly saleswoman sidled up to us. I looked skeptically at the spray can in her hand. Now I am not one to turn down a boozy sample, no matter how strange it is. She squirted a little in a small plastic cup. When we got back from holiday, I couldn’t stop talking about it. I made my mum spray it into her coffee at 10 in the morning. My friend Mary and I made hot chocolate and filled more than half the cup with mousse. I sprayed it into a shot glass and ate it with a spoon. So imagine my delight when Morand sent me a free bottle of their new mousse flavour, apricot, and asked me to come up with a recipe. I am happy to report that apricot is just as delicious as pear. I am equally happy to report that it isn’t just the perfect topping for cocktails, coffee and cocoa, but it works marvellously in desserts as well. Here, I have made a Valais version of the classic French dessert, îles flottantes. The custard is infused with saffron (did you know it’s grown in Valais? more on that here), and Morand’s delicious mousse replaces the fussy meringues. The wonderful Felicity Cloake guided me in my îles flottante making, and her description of poaching meringues made me very glad that I had opted out of that step, in favour of a quick spray of mousse. In a medium bowl, whisk together the yolk, sugar, and cornstarch. Warm the milk, saffron, and salt in a large pot over medium high heat. When the milk is simmering, whisk half of it slowly into the yolks, being careful that the yolks don’t curdle. Whisk everything back into the pot and cook over very low heat until it coats the back of a spoon. Strain and let cool completely. When you are ready to serve, spoon out your custard into bowls, then squirt in meringue shaped islands. Sprinkle with flaked, toasted almonds. 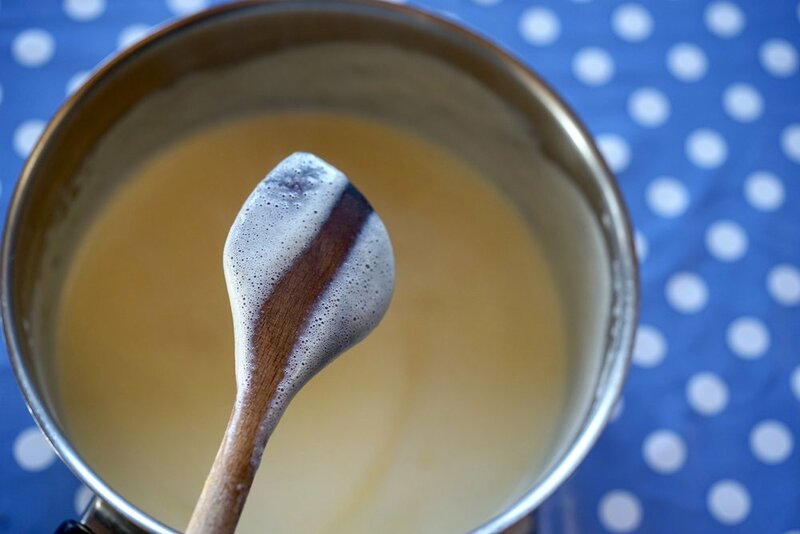 You can flavour your custard with something other than saffron—vanilla or cinnamon sticks could also infuse the milk. Mousse d’abricot is available in fine shops and online, directly from Morand.